A long dead author's spirit hovers over the people caught up in a recent murder. The Tell-Tale Tarte is an American Library Association Book Club Central pick for November 2018. ​The title of the fourth book in the Five-Ingredient Mystery series derives from Edgar Allan Poe's story about a murder, “The Tell-Tale Heart.” The victim and suspects in The Tell-Tale Tarte are all inspired by Poe: an actor famed for his one-man Poe show, an author who riffs on Poe stories, a professor who specializes in Poe, and an aspiring writer and Poe lookalike. 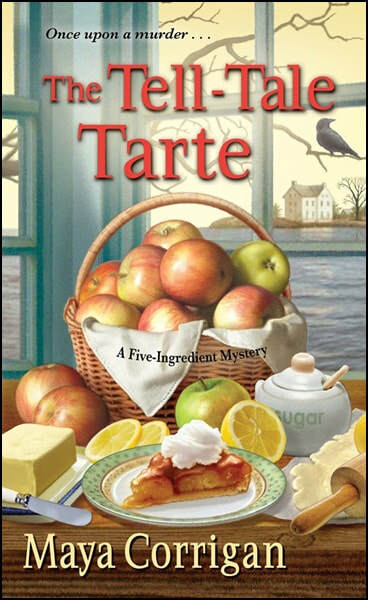 When café manager Val Deniston serves a tarte Tatin at a book club dinner, the dessert reveals a fraud, embroiling her and her grandfather in the investigation of a murder. The search for the killer takes Val and Granddad to the home of a bestselling author, Rick Usher. Stranded there by an ice storm, they spend a harrowing night in the “House of Usher.” Then, in the shadow of Poe’s tomb, they try to prevent another murder and mete out some POE-etic justice. ​As a Poe fan, I thoroughly enjoyed incorporating his writing and incidents from his life into the plot of a current-day mystery. Hailed today as a pioneer of detective stories, horror, and psychological suspense, Poe struggled throughout his life to earn a living from his writing and fend off starvation. Ironically, his first book, “Tamerlane and Other Poems By A Bostonian,” has become the Holy Grail of American book collecting, the most expensive book by an American author ever sold at auction. There are only a dozen known copies of it, and one of them figures in the plot of The Tell-Tale Tarte. Themes that Poe explored in his writing emerge in The Tell-Tale Tarte: guilt, vengeance, and even burial alive. The book offers a solution to real real-life mystery–the identity of the elusive Poe toaster, who, annually for decades, left roses and cognac at Poe’s grave on his birthday.